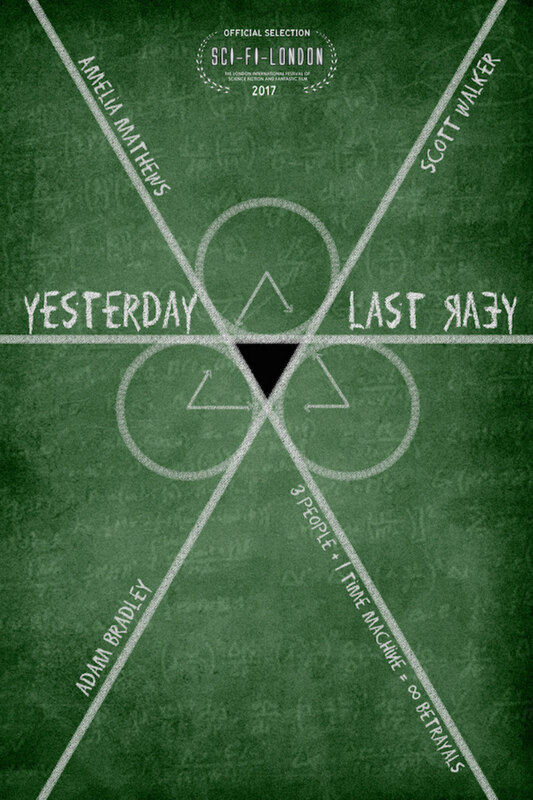 Three friends exploit time travel in order to manipulate their love triangle. ‘3 People = 1 Time Machine = Infinite Betrayals’ is one of the taglines describing Yesterday Last Year, and it sums it up rather well. The film, directed by Jefferey Hanley from a story by writer and principal actor Adam Bradley, concerns Michael, a scientist who has abandoned a career in academia, apparently because of a bitter dispute with a colleague. Michael now spends day after day in his garage, recalibrating formulas on his blackboard in an attempt to find the solution to the successful operation of a time machine. It’s taken up a lot of time already it seems, but yes, he’s building a time-machine in his garage, stubbornly trying to prove his theory and shame the colleague who scoffed at his work. This leaves little time for his wife Sandra (Amelia Mathews) who wanders in occasionally, apparently bored with writing her own doctoral thesis. She vainly attempts to get his attention, but they end up having a recurring row about his obsession, and how it is interfering with his promise to take her to Paris on a deferred honeymoon. James and Sandra are both excited by the breakthrough, and have their own plans for using the machine. Michael is less enthusiastic. It transpires that Yesterday Last Year is actually less about time travel and more about the messy mistakes and confusion of a love triangle. The three protagonists become caught up in an addiction to tweaking time in order to manipulate events and have the outcome as they would have preferred it. The three of them get caught in a circle of time - a Möbius loop, which, while initially benefitting their invention, ultimately leads to multiple possible outcomes, mistakes and corrections. However, the viewer never gets to see these – the entire action of the film is confined to one space – Michael’s garage, which contains a few props – his computer, his blackboard and a couple of what look like small chest-freezers with wires taped onto them which apparently comprise the ‘time machine’ which causes all the trouble. 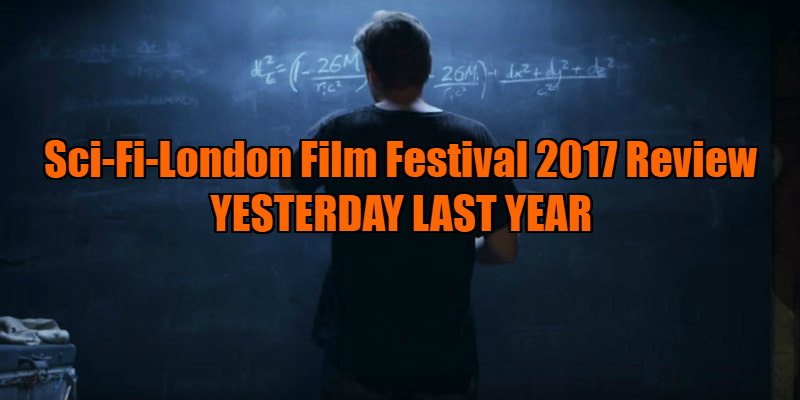 With a running time of only 76 minutes and what must be a miniscule budget - three actors, one set and a bit of camera trickery has the task of conveying the complex notion of the paradoxes of time-travel to the viewer. So, it’s really down to the way the story is told. The actors do a decent job in concisely presenting the relationships between them, but things get a bit manic and hazy when it comes to the more demanding business of imparting the muddle they get into trying to fix the past mistakes of their relationships. This is done by climbing in and out of the time machine\chest freezers, changing facial hair and clothing and shouting at each other about what they’ve just altered, sometimes to the unsurprising mystification of one of the other characters, who of course, has swapped to the other timeline that has been created. Intentions all round might be good, but by golly, don’t we all end up in a bit of a tangle.